In a video released Tuesday, Microsoft arguably began to position the HoloLens and Windows Mixed Reality as the future of education. A smart tactic meant to coincide with their other education-related announcements made on the same day. In an effort to take back the classroom from Apple and Google, the Redmond, Washington-based company took the HoloLens around the world to test its capabilities in a number of different learning environments. In every classroom they visited, educators and students seemingly agreed on the benefits that the mixed reality headset brought to their learning environment. The HoloLens allowed students to engage hands-on in their subjects to reach new dimensions of understanding. Making challenging topics for students young and old accessible by creating a more visual and tactile experience. Recently, Microsoft partnered with Lifeliqe — the visual education company that creates digital science curriculums for students by using the latest MR and AR technology — to bring augmented learning to prep schools in California. 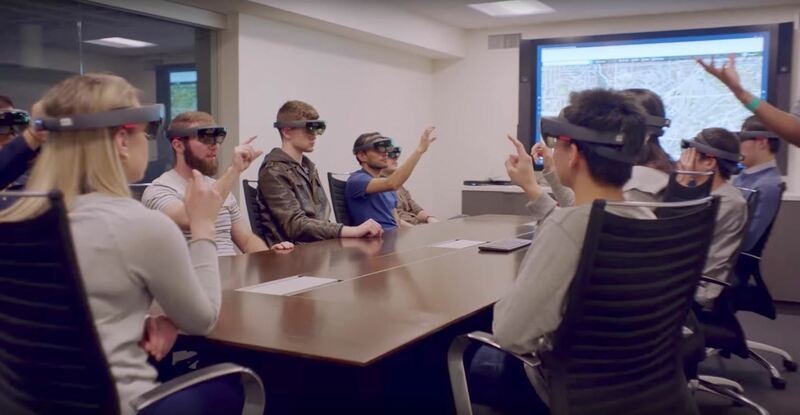 And just last year, the University of Washington hosted the world's first HoloLens class. There, computer science students got to experiment with the headset for ten weeks, testing out all sorts of different apps from making spring rolls to destroying giant eyeballs. Now that we know what Microsoft has planned for the future of education, do you have any ideas on what that will look like? If you have any other good .gifs on what Microsoft's future of education looks like, feel free to post your own in the comments below!